One of my favorite hikes in Joshua Tree happens to be in a wash outside of Joshua Tree National Park. Discovered and named by George Washington’s nephew Henry, Coyote Hole Springs is a beautiful, small, and secluded hike with rich history and pristine desert scenery. The beginning of the hike may seem a little off-putting. The trailhead is behind 2 gates and across someone’s long driveway. As long as you park on the road, there’s no issues and the gates are easily gone around, under, or over. You can ignore the no trespassing signs. However, do not ignore the “Who Passed This Way?” signs. Read them and ahere—don’t move or remove anything. It’s a wash, so it’s soft sand with areas of packed dirt. I went today and the sand was packed, hard mud. Today, it was very much washed through. It obviously received some intense rains, the mud is flowed and canyoned from the running water. There are large rocks placed halfway through to keep trucks out. The gates used to be open and the trucks could easily go down, allowing for teenage parties which always included bonfires and littering. Beginning of the hike. This shows the wash and the flow of the dirt. 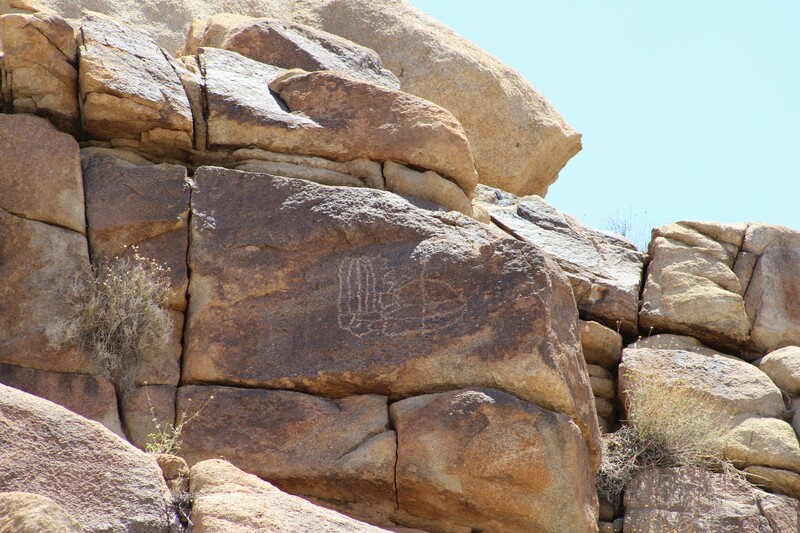 Just passed these rocks you can see the Serrano petroglyphs. On the right there are some as well as on the left. They are pretty high up and some of them are very clearly drawings of people. This is my favorite part and is breathtaking to me. Petroglyphs on the right side after the “Who Passed This Way?” sign. At the end of the hike, there is a large canyon. The canyon leads you to the left and there is a rock formation which becomes a natural waterfall with enough rain. Beside that, to the left, is the hole the coyotes dig in order to catch the rainwater. Hence the name Coyote Hole Springs. The locals know it simply as Coyote Hole. It’s a beautiful place that can transform into a river in the desert, surrounded by ancient petroglyphs. The canyon is very much a doorway into the American past. End of the hike. Straight ahead on the right is the waterfall, to the left is the coyote hole. It still had a bit of water in it today. Joshua Tree National Park is quickly becoming one of America’s favorite national parks, with record annual visitors topping one million in recent years. With over 1200 sq ft of protected park, it would take a while to explore every inch of the park. Yet, the area surrounding the park is open and vast, with the town of Joshua Tree being unincorporated, the locals know there are places without an entrance fee worth discovering. I have three hikes around town that I absolutely adore and they are all outside of the national park, they all look different, and they are all beautiful places to see after a good rain. Coyote Hole – One of my favorite places of all time, Coyote Hole is an unexpected hike. It begins on Easterly Dr in Joshua Tree. There’s a house just up the hill on the right and gates blocking the dirt path off from cars. The area is mostly soft sand and surrounded by high hills and cliffs. This is often called a wash and is an irrigation route during extreme rains. About 30 feet above the ground on some rocks are Serrano pictographs, visible with the naked eye. Zoom in with a camera and get an even better view. There are signs posted asking “Who walked this way?” and explains the natural history and preservation of the area. At the end of the hike, about a half mile from the start, is where the water falls down. It’s beautiful, minus the assholes who feel the need to spray paint. Thankfully, the graffiti is painted over quickly. Climb up the rocks and see the water if it has rained recently and enjoy the natural habitat and flowers on the hike back. In fact, if you managed to get there directly after a good rain, you’ll be able to see a natural waterfall in the desert. Big Morongo Preserve – Definitely one of the most beautiful places in the Morongo Basin, the Big Morongo Preserve is an ecological anomaly. Upon entering, there are places to sign in, a map of where the visitors have been from, and informational flyers on the animals and plants you might see along the way. It is green. There are trees, plants, streams, ponds, and another flat wash area with built in hiking paths and seating areas, perfect for photos. The light at sunset is breathtaking. There’s a large bird population and is a must-see for avid bird watchers. It’s also an amazing place for photography. 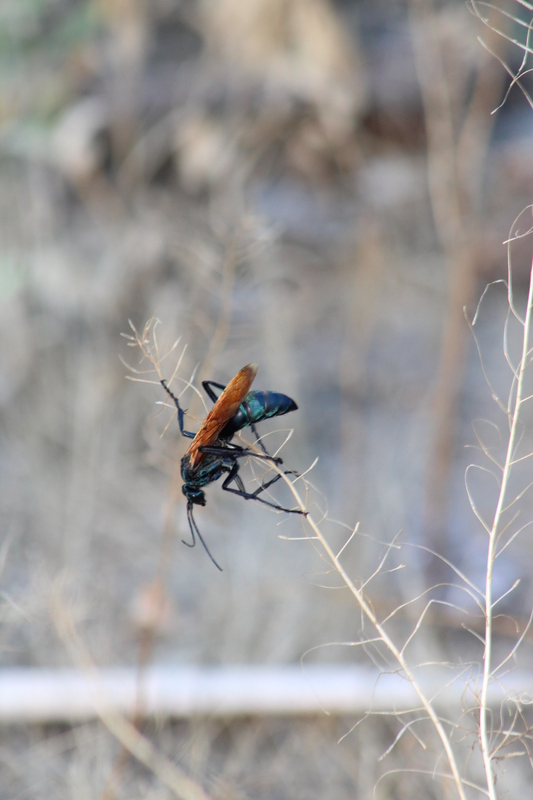 Tarantula Hawk (wasp) photographed just off the trail at the Morongo Preserve. Rattlesnake Canyon – Regardless of the foreboding name, this is one of the absolute best hikes in Joshua Tree and you can do it for free. It requires some minimal rock scrambling, but it is the quickest way to get the best view of the Wonderland of Rocks. There are waterfalls, sometimes if there is enough rainwater, the beginning of the trail turns into a small creek. 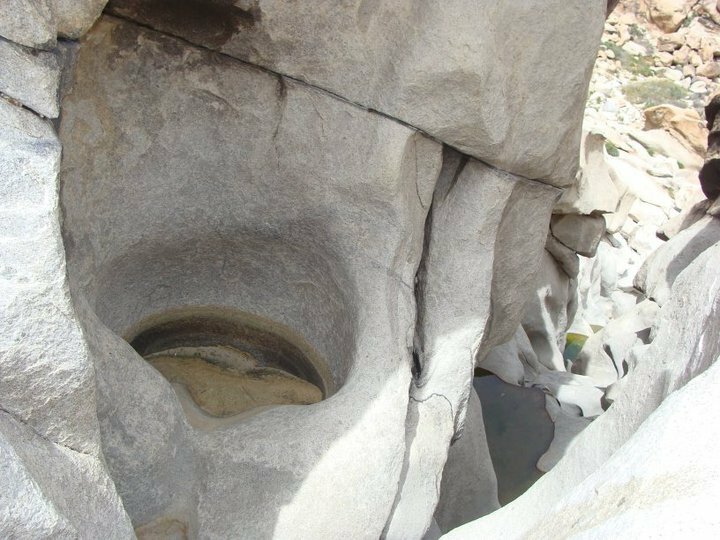 The hike features small running waterfalls and pools throughout and the top ends in a gorgeous maze of rocks and puddles, some of the rocks perfect for sunbathing. The top also sports a gorgeous view overlooking the desert. Looking down the rocks at Rattlesnake Canyon a few days after a rain. The desert isn’t as brown and boring as most assume and people are beginning to come around. As a local, it’s fun to find great places and share them with people who will seek them out and truly appreciate them. This desert is a magical place and these three spots just happen to hold a special place in my heart because I have seen them all that their best—full of water after a great rain. They only add to the mythical feeling and lure of the desert, a place I never pictured myself seeing and now a place I will never forget. When thinking of a family vacation, the word ‘desert’ probably doesn’t come in on the list of Top Five Places. It’s time to rethink that outdated list and discover the beauty of the southern California high desert. From big, clean skies to awesome murals and landscapes, the desert has something for absolutely everyone. The Seasons Rock – The best thing about the high desert is the temperature in every season that is not the summer. Spring is obviously the most vibrant. After a nice, wet winter, the desert floor is often coated in a yellow blanket of wildflowers. The fall air in the high desert is crisp and cool, a distinctive feeling that comes around right before the temperatures begin to drop. High desert winters, unlike the lower Colorado desert, get cold enough for snowfall, which usually happens once or twice over the season. It’s a marvelous sight, the Joshua trees all covered in white snow. Such a beautiful contrast. The summers are usually hot, but not unbelievable like Palm Springs. Tent camping is totally possible and comfortable virtually year-round. 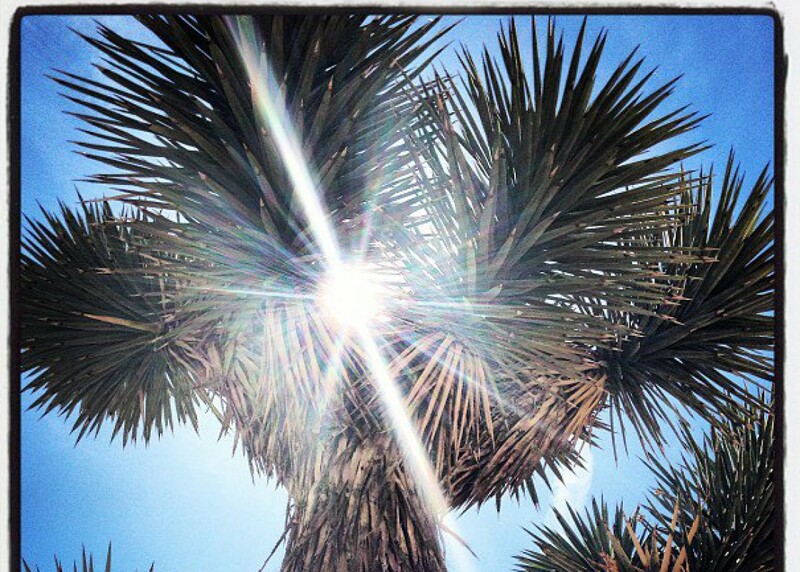 Joshua Trees – One of my favorite things about the high desert are the Joshua trees. They are fickle and need a particular amount of dryness, rain, and elevation to prosper. They are only found in the Mojave Desert, making them a bucket list must see. They look weird, almost human like, which is how they got their name. They resembled Joshua from Biblical times reaching up toward Heaven. However, once you realize they only grow in a certain area, you will begin to realize Hollywood uses that desert for everything. In Kill Bill, the church they go to is supposedly in Texas, but there are Joshua trees surrounding it. Sorry, guys. Music and Art – Unless you lived under a rock in 2014, you probably heard about the show Dave Grohl made which features recording studios from across the country. It was called Sonic Highways and they recorded a majority of the Los Angeles episode in Joshua Tree at a small house/studio called Rancho De La Luna. Joshua Tree has an incredibly developed, rich artistic community. There are numerous art shops in unincorporated Joshua Tree, as well as neighboring Yucca Valley. The local honky tonk is exploding in the LA music scene, as well as the local music scene, which now sports an online radio station. There are murals galore in every city in the Morongo Basin. There are local art tours, world renowned mural artists, writers, and soon there will even be an International Film Festival. There is always something going on, so when you’re in town, don’t forget to take a look on a “what’s happening” cork board, of which there are quite of in Joshua Tree alone. Smog-Free Skies – An extreme rarity in Southern California, the Morongo Basin sky lacks smog, revealing itself in all its glory. The Milky Way drapes across, behind Joshua trees and cactus, the moon peeking through Yucca leaves. During the day, your family can enjoy hiking in clean air at an elevation that is not unkind to young lungs. While other attractions across Southern California are in the middle of traffic-heavy cities, Joshua Tree National Park and the surrounding areas maintain cerulean blue skies filled with fresh, minimally polluted air. Unplugging is Good for Your Soul – Unplugging from the digital world and plugging into the real world via a trip to Joshua Tree is the perfect way to bring everyone closer together. From pictographs left behind by the Serrano Indians to rock climbers highlining between rock formations, the sights around you will keep your face from being buried in your phone. Like many places that have been relatively untouched, the desert possesses a certain magic and it’s palpable from the minute you arrive. The sights and sounds, even the glorious smell of creosote after a good rain all mix together and give the air an almost electric feel. There really is nothing like the desert, especially a place like Joshua Tree National Park. Don’t be afraid to venture out and see why this is one of America’s most beloved national parks and why people from all over the world come to stay. Show your soul a place more inhabited by wildlife and plants than by people.